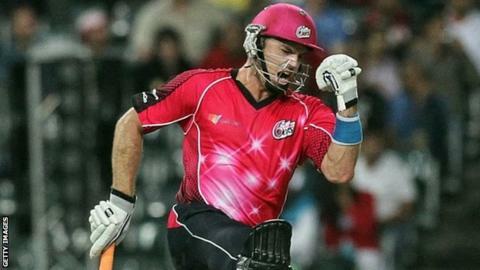 The Sydney Sixers beat the Highveld Lions by 10 wickets to win the Champions League Twenty20 final at the Wanderers in Johannesburg. Nottinghamshire and England opener Michael Lumb scored 82 not out from 42 balls as Sydney chased down the Lions' 121 all out with 45 balls to spare. Lumb, who was born in South Africa, hit eight fours and five sixes. New Zealand spinner Nathan McCullum (3-24) and paceman Josh Hazlewood (3-22) were the pick of the Sixers' bowlers. The Johannesburg-based Lions were sent in to bat in front of a sell-out crowd and soon crashed to 9-4. Only a knock of 51 from Jean Symes saved the Lions from complete humiliation and they lost their final wicket from the last ball of the innings. Lumb and fellow opener Brad Haddin (38 not out) were dropped during their innings but the result was never in doubt. Sydney, who went through the tournament unbeaten, receive $2.5m (£1.55m) for winning the fourth instalment of the event while the Lions claim $1.3m (£806,000). English representatives Yorkshire were knocked out in the group stages, while Hampshire were eliminated from the competition after losing their first qualifying match against Auckland Aces.